that are said to return and stay homes during this period. Bon is held from August 13 to 15.
to welcome the ancestors' souls. Priests are requested to come and recite sutras (tanagyo). to guide the way for the souls. to send off the visiting souls. 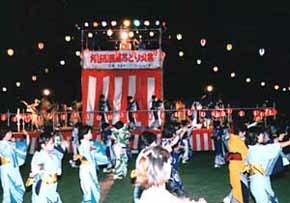 The Daimonji-Gozan-no-Okuribi in Kyoto is the very famous Okuribi. 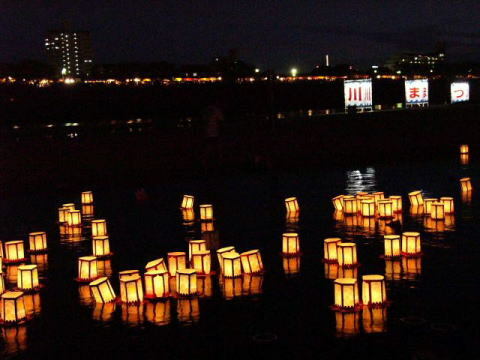 Shouryo-nagashi or lantern floating, a variation of Okuribi, is done in many places in Japan. to comfort the spirits of ancestors. Most Japanese companies take around 3 to 10 days for Bon vacation. Usually families living in the cities return to their hometowns. However, year after year the tradition of Bon is slowly fading. sometimes people travel abroad or domestically and enjoy the holoday.